There are lots of ways that you can support us. You can become a member of the branch for only £7 a year for an adult and £4 a year for under 18s. You will receive regular newsletters which are filled with information on fundraising events and stories of some of the cats your membership has helped to assist. Click St Albans Branch Membership Form to download a form. Complete the form, and send with your payment, to the address on the form. 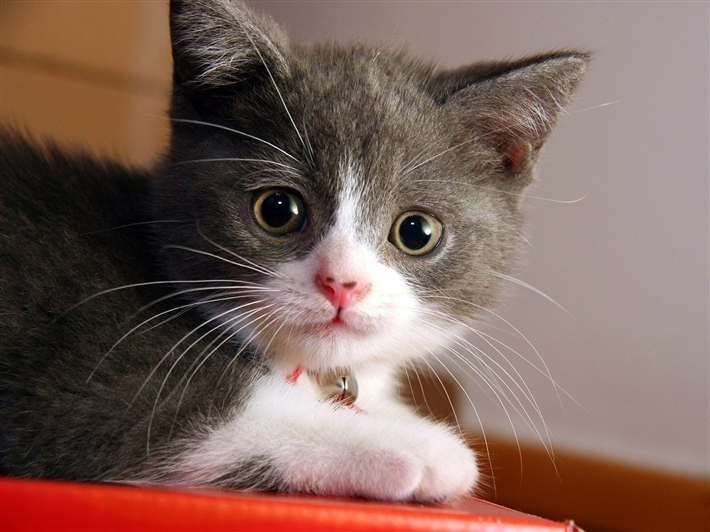 Membership can also be gifted to others, so you can also make a fellow cat lover a member! It costs lots of money each day to keep a cat at one of our fosterer's homes - in addition to all the basics such as food, litter, heating, we have to pay for all the medical bills, flea treatments, blood tests , neutering, vaccinations and micro-chipping, among other things! This is why we rely so heavily on the kindness and generosity of the local people. You can now donate by text message. 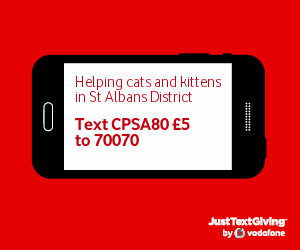 To do so, text CPSA80 and an amount of £1, £2, £3, £4, £5 or £10 to 70070. Alternatively you can donate online, via our JustGiving page here. If you would like to make a donation, or set up a standing order to help us, please contact our treasurer on 0345 371 2064. Alternatively, just click on the Donate button in the bucket in the top right corner of this page and complete the form. Please remember to always include your name, address and indicate if you would like to give gift aid when you send in any donation. Not only will we be able to thank you but we can also make sure that your donation will qualify for Gift Aid meaning that we can a further 28p in every pound from the tax man! We rely solely on volunteers to make the branch work! We would welcome your help especially if you think you may be able to help to look after cats in our care whilst we find them new homes! Fosterer's (cat carers) temporarily house cats whilst waiting for them to be re-homed - this can be done in a spare room or in a purpose build cat pen (provided) in your garden! All expenses are paid for, and the role gives enormous satisfaction. Quite simply, we cannot operate without fosterers! Contact us for more information. If your cat is anything like most cats there will be one flavour of cat food in a selection box they won't eat. We will gratefully accept these sachets and tins! Just collect them together and, when you have a bag or box full, donate them to us. We have cats which will be glad of it! Contact us for details of where to take the food, or we can collect. If your cat also has scratching posts, blankets and toys they have not used or played with we would be very grateful for these items also. Do you have unwanted gifts? If the answer is "Yes" then why not donate them to our branch? We are always in need of items for our Tombola which is a real favourite at our fundraising events. Please contact our Branch Helpline number for us to collect. 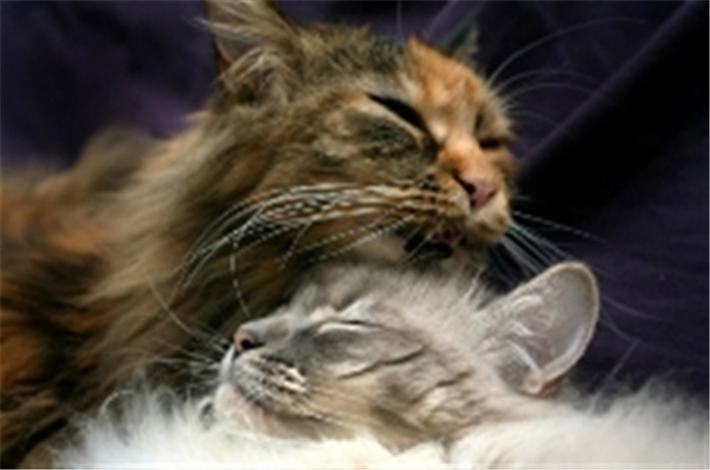 Gifts in wills provide an important income for Cats Protection. We are grateful for the kindness of people who remember us in their will, and this is a significant source of support for the work we do. It allows us to keep our promise that we will never put a healthy cat to sleep. For more information on leaving a gift in your will, please click here. Thank you for all your support and help and for thinking of us with your donation. A big thank-you goes to Mrs. B who donated to St. Albans Cats Protection all her online shopping points so that we could purchase new food dishes, bedding, scratching posts and toys for all our pens. In addition, thank you for the LUXURY kitten scratching posts. Our forthcoming kittens will have hours of fun enjoying these. Thank you so much for making our fosterer's very happy and for enriching the lives of our cats in care until they go to their new homes. This was an inspired idea that we would not have thought of because of the specific nature of the shopping points. Does anyone else have any shopping points that they could donate to us? Even Nectar or Tesco Club Card points would mean we could buy extra cat food and litter.